Does the barista at your coffee bar serve your kid a steamed milk with a dash of cinnamonâ€“just the way he likes it? Is your baby already a regular at the neighborhood indie bookstore? If so, your budding bohemian deserves a wardrobe that suits his or her creative lifestyle. For childrenâ€™s knits with style and attitude, look no further. Boho Baby Knits contains more than 30 designs for clothes, toys, and accessories that are so cool, youâ€™ll wish they came in your size. 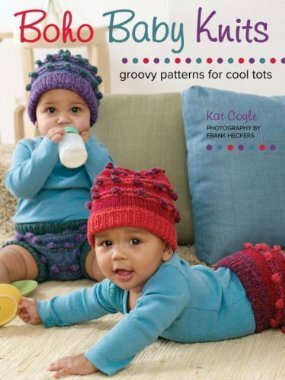 Knitters will love the fun literary references, punk rock allusions, and beatnik musings that inspire these patterns for newborns to four-year-olds, and kids wonâ€™t be able to get enough of these bold, colorful, and unique projects. With patterns designed for all levels of knitting experience, crafters can knit a simple present for a baby shower in a day or two or create a very special project over a couple of weekends. Clear, step-by-step instructions, easy-to-read charts and diagrams, and dozens of four-color photographs ensure happy results. From graphic leg warmers and a folk festival frock to a bohemian striped boat neck and a Western-style jacket, Boho Baby Knits keeps kids dressed like the free spirits they are.